1. This angry child is writing a note instead of screaming. This behavior shows excellent self-regulation. He or she has learned how to handle anger and to communicate in a safe and effective way. 2. This child is giving himself or herself a time-out. My guess is that the ban on communication did not last for two days - all day. The two-day ban tells more about the intensity of the anger than the child's need for alone time. 3. The child expresses anger but does not attempt to manipulate. Children need to learn to deal with anger and with parent decisions that can cause anger. Children need to know that they are loved even when they hear the word "no." 4. It demonstrates that this child understands, knows, and receives unconditional love. 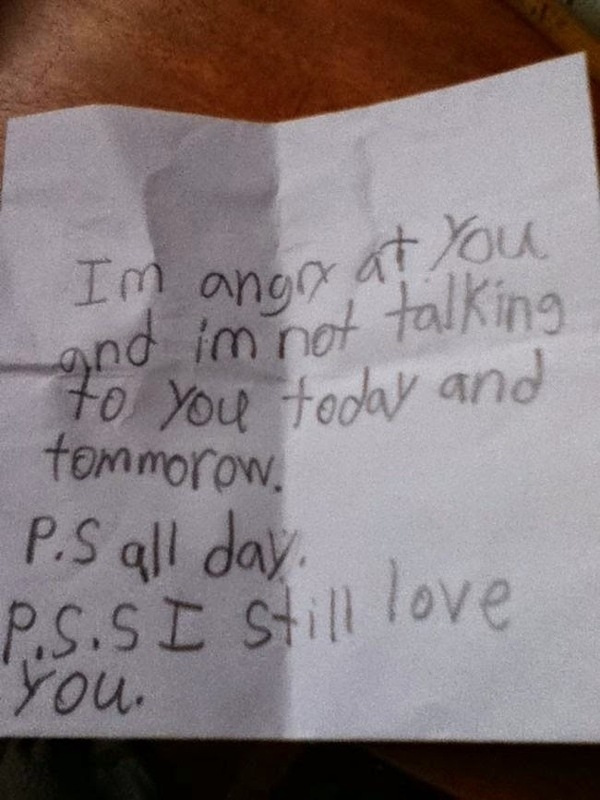 This child knows that love is stronger than anger - even a really big anger. 5. This child has learned empathy. He or she can express anger, but still remember to express love because that is what has been experienced in the past. Never underestimate the power of unconditional love!